Holiday Outfits for Men: Holiday season, this word brings a sense of calmness and excitement at the same time in everyone’s mind. Throughout the year you are working and earning and when you that the time for the holidays are nearing you become keen on making plans and choosing outfits. This is because the dressing is an essential aspect of everyone’s holiday season. Holiday season’s beginning means that it’s Christmas or a new year then parties and dinner and lunches or other commitments will be an important part of your schedule. Same goes for Thanksgiving etc. Going places you need to be the owner of a classic fab wardrobe. 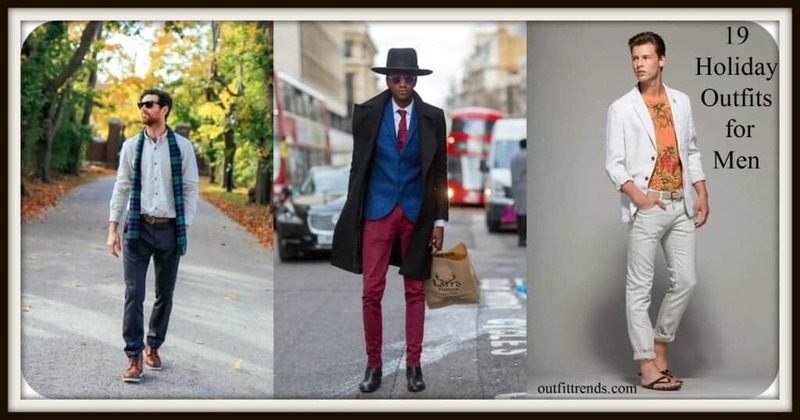 For this men especially need some semblance of thought before diving into the arena and for that outfit trends have made this article available for men so that they can be as handsome and classy as they can be. If you are planning your holidays near the sea, then this kind of outfits will be best. Always keep a windbreaker handy as the climate can take a sudden turn. This olive green shade has been making rounds in the fashion arena and will be good if you invest in this piece. Blue stripped shirt and oxford styled shorts with flip flops are a perfect pair. Keep your hair gelled and pompadour styled for a stylish and decent look. Safari holidaying calls for the same kind of dressing. Coverage from the heat and subtle colours as the sun is too bright. This double pocket shirt is ideal with beige chinos rolled up. You can also go for boots if going for a long day trip. Keep hats and sun blocks handy. Beach summer parties or just chilling out at a friends pool party. Orange is an unusual color for men but when combined with white in this manner it looks great. Cool and relaxed vibes. #15. Partying During Holidays– An all white suit will be a significant investment especially if you are going someplace during summers. But this can also work for you for Christmas as well. Just wear a red shirt underneath and proper boots. Neon trend has not kept itself for only one gender. It can also look good on men if they know what to wear and how. As shown you can wear an orange wind breaker with the same colour stripped shirt and keep it subtle with white mini oxfords. Festive red sweaters are kept at the back of your wardrobe throughout the year but its time to take them out for Christmas and new year.